We are an accepting community committed to worshipping the Living God, growing relationships, and helping each other become all we were created to be. We have a relaxed atmosphere. Enjoy a freshly brewed cup of coffee and donuts available in the atrium. 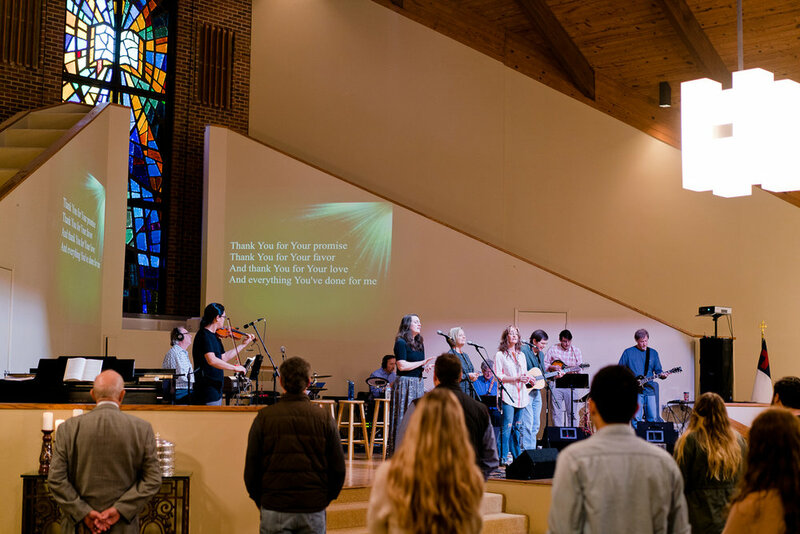 We worship with a mix of traditional and contemporary music, and preaching straight from the Bible. Important Notes: On the first Sunday of each month The Lord's Supper will be offered during the worship service. To allow families to worship together during the Lord's Supper, there is no Children's Worship on first Sundays. On the second Sunday of each month we have a church-wide, covered-dish luncheon in the fellowship hall. Time & Location: Sundays at 10:00 am and Wednesdays at 6:30 pm at 262 N. Perkins Rd. Information: Our greeters, located at the main lobby doors, will be happy to assist and answer any questions you might have. Accessibility: Evangel Church is an accessible facility. If you require wheelchair access, designated parking or seating, directions to our accessible restrooms, or additional assistance, please don’t hesitate to ask. Our Preschool and Children’s corridor is located to the left as you enter the main lobby and staffed by helpful volunteers that will make sure your children get to the appropriate location. Our child services are safe and secure and are available for children 6 weeks old to Pre-K and Kindergarten up to 5th grade. Childcare provided for children ages birth-K for worship service. Children's worship is offered for children grades 1-5.